The comprehensive range of SteelEdge power hoists and motorised trolleys have been designed and manufactured for use in a wide variety of industrial applications. 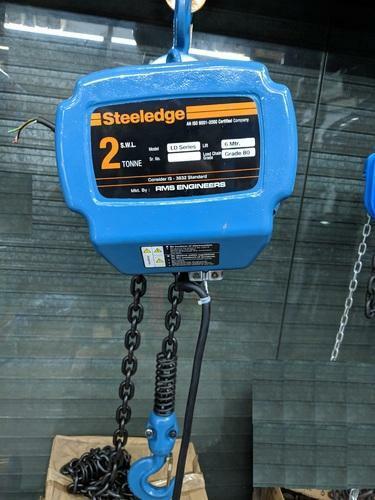 Highly versatile and easy to use, SteelEdge electric hoists range in capacity from 300 kg to 20 tonnes to guarantee smooth operation in the manufacturing process. INDIA INDUSTRIAL STORES is one of the Indian leading Supplier of Manual Chain Pulley Block, Electric Chain Hoist, Electric Wire Rope Hoist, Hand Pallet Truck, Stickers, and Forklifts. we have dedicated ourselves to achieve the ultimate excellence in our products and services. We manufacture Manual Chain Hoist as per IS-3832, Electrical Chain Hoist as per IS-6547, Wire Rope Hoist as per IS 807, 3177, 3938 and 4137 standards which assure the quality of products. We are in a position to manufacture various type of Hoists & EOT Cranes as per customer\'s requirements. We have large number installations, which include different type of industries like Textile Industries, Food Industries, Power Plants, Furnaces, Rolling Mills, Sugar Mills, Pipe Mills, Paper Mills and Allied Industries. Every product undergoes strict & intense quality test. We ensure that they meet all our customer requirements. INDIA INDUSTRIAL STORE'S Products enhances smooth & quite operation, easy installation, minimum maintenance and long lasting life. We have a long list of satisfied clients through 18 states in India.